Nicholas' Touch: Angel Wing "Helpers"
Love it. Your boys are so handsome, and cute. I love that they are helping you and understand the meaning behind what they do. 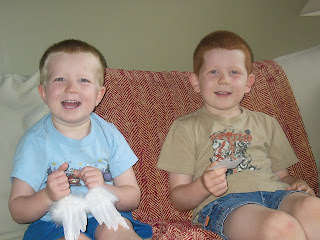 Speaking of the wings, is there a way to get the angel wings you made for my boys? I'm not sure how that works, how you handle the wings once you've made them. If you could let me know, or lead me in the right direction, I would appreciate it. I love the wings. Look at those two little angelic boys!! I think that makes them even more special! Hi Kristy - I would be happy to send you the boys wings. If you could just email me your mailing address I will get them out to you shortly. what very handsome helpers you have.. :) and how special it is of them to help! Wow. That picture is so powerful. All three of your boys are gorgeous! They are so cute. You are an amazing mom. This is one way to help them with their grief too. Those boys are just precious! Wow, what great helpers! So sweet of them. I love that your boys help you make the wings. My son Murray was perched on my shoulder as I read your post and he asked "who dose boys mama?" and I told him that they are other big brothers whose baby brother is in heaven and that they help their mama make angel wings for families like us and he responded "oh that's so nice of them mama, to help their mama not be sad". Again I wish I had the grace and sweet simple acceptance of my 3 year old. Am soo looking forward to getting Caydens wings. I got the link for my NILMDTS photos and am trying to decide which photo to print to put his wings on. You do the work of angels here on earth.